Long lasting and resistant kitchen cloths made with powerful microfibre. Cuts through grease & grime with ease. Made from a special weave making them super resistant and efficient after washing. 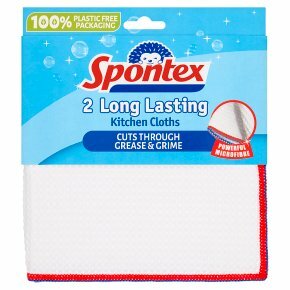 Cloth size: 36 x 36 cm.Designed with microfibre technology, Spontex 2 Long Lasting Kitchen Cloths are the latest generation of kitchen cloths. Made from a special weave, these kitchen cloths are super resistant and will stay efficient even after washing. They cut through grease and grime with ease leaving your dishes and kitchen surfaces sparkling clean. And did you know, each Spontex Microfibre cloth is made of thousands of tiny fibres, so the number of contact points with the surface is greatly increased compared to a standard cloth. Suitable for all kitchen surfaces including: Ceramic hobs, stainless steel, granite, wood, formica and tiles Not suitable for use on hot surfaces.